Spectra slot has 5 reels which are set in the center of a dark background within an electric blue frame in this Retro themed slots game. However the Thunderkick developers have used 4 rows of symbols rather than the usual 3 that are often found which gives it a unique twist. 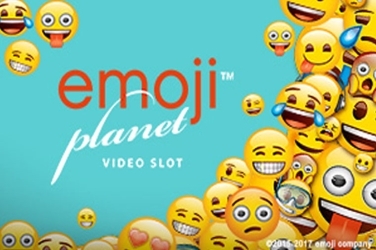 Some players may be reminded of the NetEnt’s Starburst Slot game or traditional Space Invader game when they see the style used for the graphics and symbols in this new casino creation. But clear crisp colors have been used which creates a vibrancy on the screen throughout play. 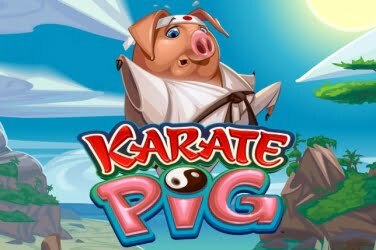 Since its release in September 2016 this slots game has proven popular with numerous players from around the globe. They can locate the reels whether using a Desktop, a Tablet, or a Mobile device which makes it easily accessible whatever the player’s location. The designers have included futuristic sound effects and when symbols are included in a winning combination strobes of light glisten through them. It adds to the Sci-Fi feel of the game and with 30 structured paylines there is plenty for players to enjoy in Spectra slots. Colored shapes are the lowest paying symbols and a vibrant light will fill the reels when they land on the screen. 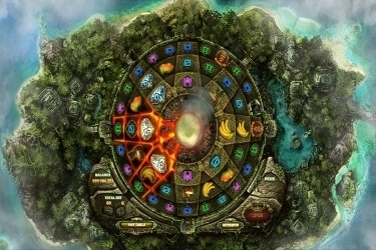 There is a Red Pentagon, a Green Square, a Deep Blue Circle, a Sky Blue Triangle, and a Purple Diamond and they all appear regularly during play. 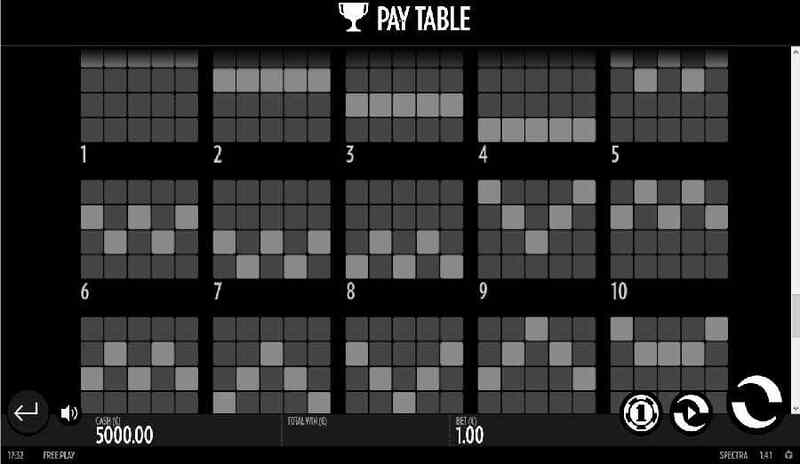 Players can also find a Green Clover, a White Chunky “Bar”, and a Golden Bell symbol which all offer higher pay outs when they are included in a winning combination. Wild – this symbol is a Rainbow Colored “W” and can appear stacked upon any reel. If players are lucky enough and fill the screen with this symbol they will be rewarded with Bonus of 20x their initial stake being added to their final jackpot balance. Thunderkick have not included any other Bonus Symbols within the games format but the “W” will activate the only Feature that has been added for players to enjoy. 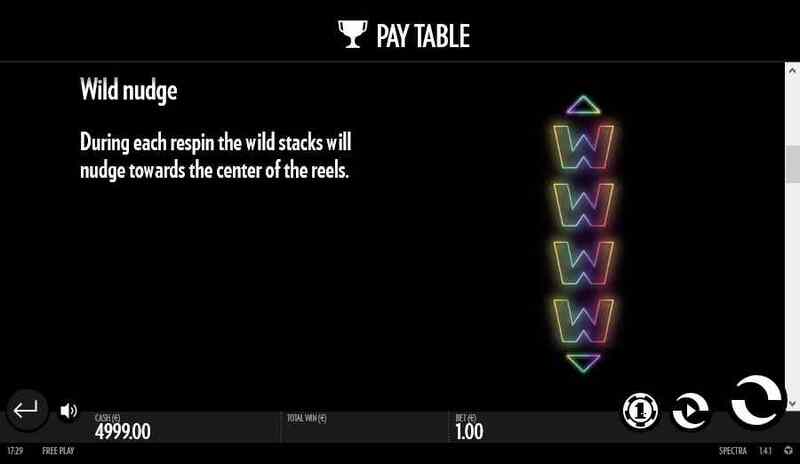 Wild Re-Spin and Nudge Feature – each time the “W” Wild helps to create a winning payline the player is rewarded with 1x Free Spin. At this point in the Spectra slots game the Wild will be “nudged” toward the central reel which can lead to them filling the screen as long as they keep falling. This Bonus Round will continue until no more Wilds appear during a “re-spin” and the base game will then again come into play. 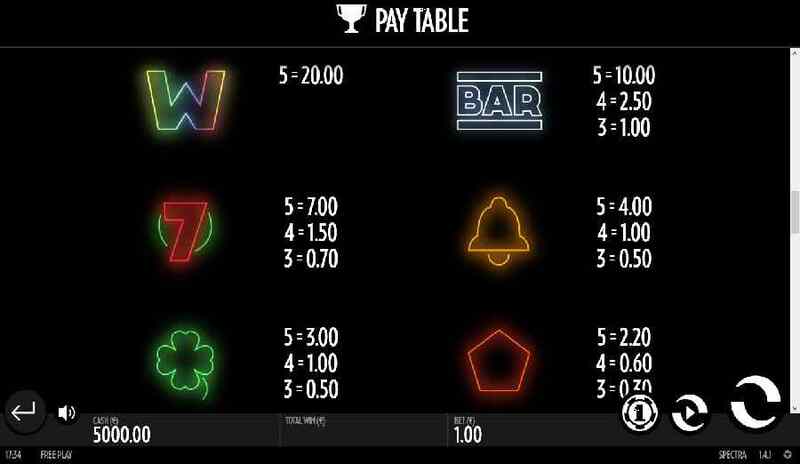 Players have 30 different paylines to wager upon before the game can begin and then they can set the 5 reels to spin. The initial stake can range from 0.10 to 100.00 in this Thunderkick online casino game. Meaning that both high and low rollers can enjoy the game while taking advantage of its fun Bonus Feature. Even those players who prefer to be less interactive with the software can still engage in the fun elements that have been included in its format by using the Auto Play Feature. 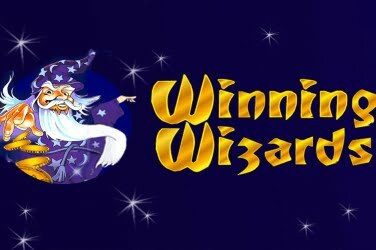 It allows the reels to be spun automatically for either a certain amount of times or until the maximum wager is reached. A perfect solution for players who need to be away from the screen for a while. 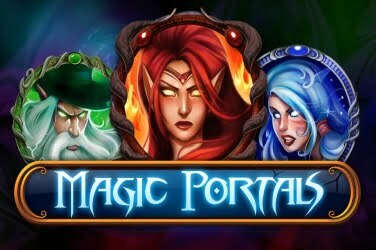 However this casino game is all about the “W” Wild symbol and the Re-Spin and Nudge Feature that it activates. With this in play up to 2400x can be added to the bet amount with each spin of the reels. It is something that is proving appealing to high rollers and those who wish to try and maximize their winnings. And even though there isn’t a Progressive Jackpot, a Gamble Feature or any Mini-Games included in the games format it is still filled with plenty of chances for players to add to the jackpot that can be claimed. 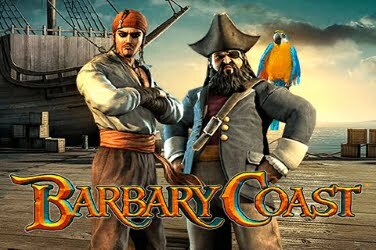 Though the game has a basic format which some players may find a little dull if they prefer more thrills in their slots it is ideal for beginners. The format is easy to grasp and the structured paylines offer various chance to increase the player’s winnings. However this is considered a High variance game so those players with a restricted budget will need to keep an eye on the remaining balance. 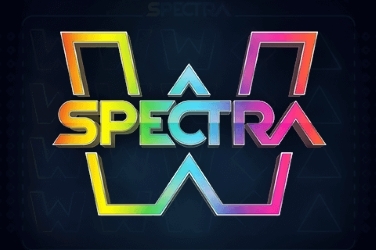 Give Spectra a free spin here or visit Thunderkick Casinos to play for real money.